Winter weather and tomato-based pastas make perfect pairings (and even more so with a bottle of wine). Our partner in Rome, Jo Wennerholm of Frascati Cooking That's Amore, provides another delicious pasta recipe that may stir up some lively debate of preferences at your dinner table. Whether you want to call it Amatriciana or, as the Romans usually do, simply and laconically “Matriciana”, one rule applies: it is all about the ingredients. For reasons of blogosphere self-preservation, I will refrain from getting into the ‘origins’ of the ‘real’ A/Matriciana because I haven’t the time just now, it being a hornet’s nest of a topic and best left for another occasion. The subject of a true A/Matriciana ignites fiery Pasta Policing and wars. However, I can pacifistically attest to the following: a Roman Matriciana concedes the inclusion of onions (which I don’t usually bother with) and a splash of wine – again, something I don’t bother with, although I did this time with the recipe I am outlining below. When making this particular Matriciana, it was Charles Scicolone who came to mind. We were having a jolly nice lunch together with his wife Michele and our friend Michelle Smith earlier this year at the now Michelin-starred restaurant called "Da Sora Maria e Arcangelo” (Michele, Michelle and Michelin … all these Mich-es!) in Olevano Romano. Charles ordered a Matriciana, one of his favourite pastas. He said he liked it well enough … and the pasta itself was fresh and home-made … but there was an unsaid ‘but’ hovering in the conversation and eventually he spilled the beans. 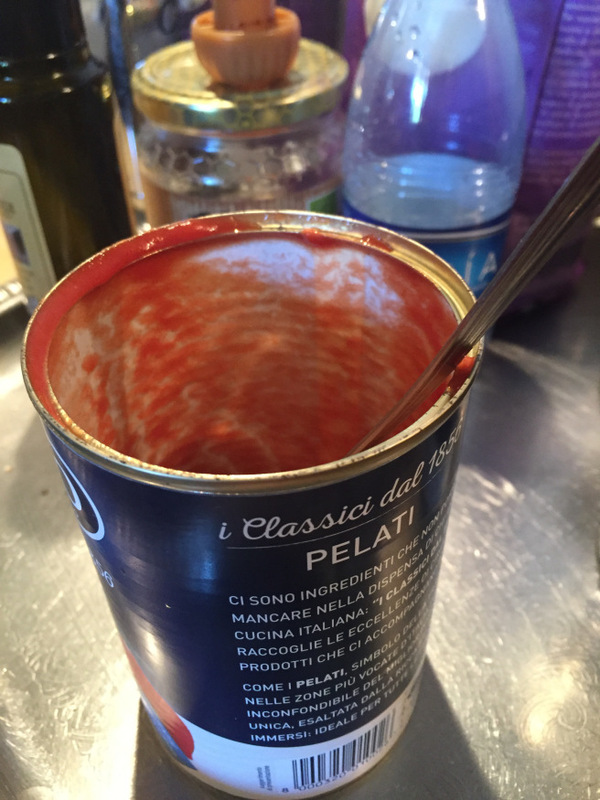 But, he told us, the amatriciana he had just eaten was not as good as the one he had enjoyed some time previously at the Casale del Giglio wine estate. The reason? He preferred his guanciale to be crisp. Now, as a rule, there is no mention of the A/matriciana’s guanciale having to be crisp (the same goes for a carbonara) but I ‘got’ what he meant, I like it that way too (my daughter, instead, doesn’t … she prefers it to be softer on the palate). So the “tweak” in the title refers to the guanciale being crisp. The “tip” instead is something of my own making, which I think makes a lot of sense. I hope to persuade you of its usefulness, in a waste-not-want-not sort of way. It all begins with putting the water onto the boil, and then trimming the guanciale (the cured pork jowl). Instead of throwing away these trimmings, also known as cotiche in Italian, once boiled, they can be used to flavour many another good dish (such as pasta e fagioli for instance). I also had the notion that these trimmings might impart another edge of ‘flavour’ to the cooking water of the pasta. There is no need to wait for the water to come to the boil: you can add the trimmings of the guanciale (i.e. the exterior lining/edge that is not normally eaten and all too often thrown away) straight away. My guanciale slices, now without trimmings, had been sliced a little too thickly so I decided to give them a pounding to flatten them a bit. Ah, that’s more like it. The guanciale now needed to be sliced into a matchstick shape. If you can, try and cut the guanciale matchstick so that there is a piece of the meat encased by fat at both ends (i.e. meat in the middle, fat on the outside). So, while the water is doing what it’s supposed to do and not requiring any attention just yet, we can carry on with cooking the guanciale matchsticks. The guanciale is full of good fat, so let it cook over a low heat in order let its fat ‘render’ – i.e. let the fat ooze out into the pan. As in the photo above. The photo above contains about 2/3 of the total guanciale. The remaining 1/3 of guanciale is left to render in another saucepan, a teensy weensy one. Here are the two saucepans. I poured some white wine into the large saucepan and turned up the heat. As you can see below, the guanciale is cooked but not ‘crisp’ as such. This guanciale is what is going to make the matriciana sauce taste good! Once the wine had evaporated, I added a little bit of olive oil and a small amount of chilli, for a bit of spice. 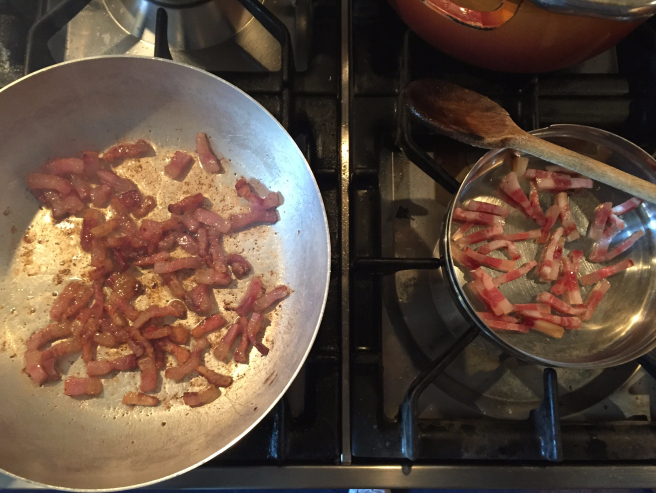 And once the smaller saucepan’s guanciale cooks to a crispy consistency, remove and set aside. Transfer the fat that has rendered in that teensy pan into the larger pan. It’s actually easier to do all this than it is to give instructions! Add fresh or tinned plum tomatoes to the saucepan and let it cook down. Add salt and even a bit of sugar if necessary. Okay, so now we can remove the cooked guanciale trimmings from the boiling water and allow them to cool. Once cooled, they can be placed in the freezer to be enjoyed at some point in the future. But back to our Matriciana. Okay, so the water has come to the proverbial rolling boil and is looking pretty oily, in a good way! All that fat. All that is called for now is the required amount of coarse sea salt (roughly 10g per litre of water is the rule of thumb). Add your pasta and we’re nearly there. Grate plenty of pecorino romano. When cooked al dente, drain the pasta (spaghetti in this case, bucatini are also very common in Rome) directly into the saucepan.… Turn the heat up and add a little bit of the cooking water. You know the drill. And no bits of green, please! No gilding this lily with basil or parsley or mint. Just unadulterated matriciana sauce. This is not supposed to be a ‘light’ sauce. It’s supposed to keep you company all afternoon as you let your body lingeringly digest it. A snowfall of pecorino over the pasta and last but not least… the crispy guanciale on the very top. And if anyone should object to the guanciale being crisp, he or she can just put the offending pieces to one side of the plate. It’s making me hungry just looking at it. Love the colorful plate Jo used to serve her spaghetti all'amatriciana? Shop the collection here!